Check out the opening program of events for the launch of the Academy in October 1990. 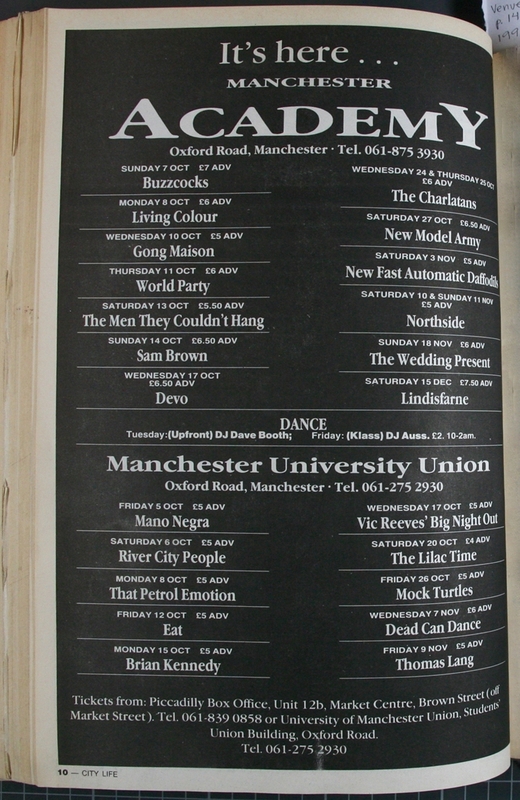 Buzzcocks were chosen as a suitable band to kick the venue into life and both The Charlatans and Northside each played a pair of shows highlighting their popularity at the time. I've heard that the Devo show was a poor seller and was eclipsed by the hugely popular Vic Reeves' Big Night Out taking place in the university next door. The first of the two successful club nights are listed as Upfront with DJ Dave Booth and Klass with DJ Auss.